An estimated $50 million dollars in food sales are seen in preparation for Super Bowl Party events. Half of those that partake in this annual event spend more than $100 on food. More than 100 million pounds of wings are consumed and 8 million pounds of popcorn. If you are planning your own Super Bowl Party event, the following invitation wording ideas will encourage you with the right words. Are you ready for some football. Come join all your rowdy friends for some Super Bowl Fun. Come on over and have some fun. We are inviting everyone. Come to our Superbowl tailgate and take a eat. Let’s watch the team that can’t be beat. [date and time]. [location and address]. Go Team Go! Join us for a Superbowl Party on [date] at our home located [address]. It’s Official. The best Super Bowl party will be at the [name]. Penalty for no show’s. Join us to be an armchair quarterback. Kickoff time is drawing near. It’s time to let out a great big cheer. Join our tailgate for a whole lot of fun. The countdown to the game has just begun. Pass, run, score. That’s what the day has in store. Join us for a Super Bowl Party. Rain, Sleet, or Snow. All our rowdy friends are invited to come in out of the cold and join us for a Superbowl Party. So the officials are conferring and you may disagree, however, one thing is for sure… a great game it will be. Some will drink beer and watch the game and cheer. While others will watch a flick, sip wine and hang with the chicks. You can’t loose which ever room you choose. Superbowl Sunday. [names] cordially invite you to a Championship Blowout on [day of week], [date] from [time] to [time]. Tailgate Party. Meet at [name] house at [time] for the caravan. Remember your ticket’s because you can’t have mine. The [team] had a great season, but it has come to an end. We are having a celebration, please come and bring a friend. The refs have conferred and we agree we want you at our party. Join us for the Super Bowl. Time to kick some [bleep]. Your invited to the [name] annual super Bowl Party. Please bring a dish to share. Touchdown. Please join the [name] family for burgers, beer and cheer at our Annual Superbowl Bash. 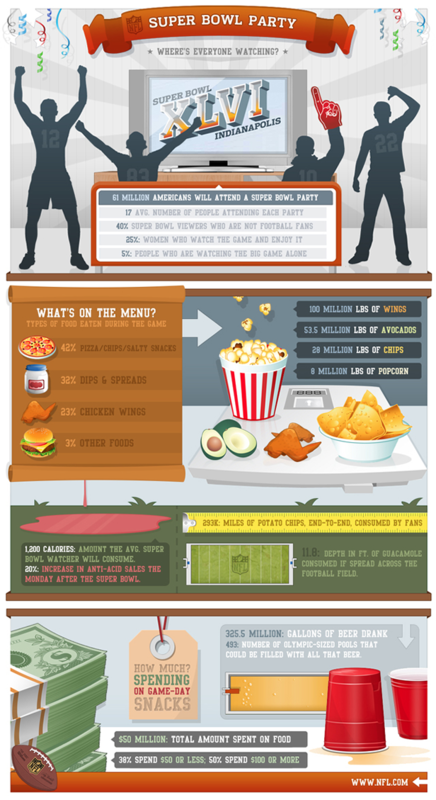 The below infographic outlines the facts about food consumption and celebrations for Super Bowl parties. More than 61 million Americans will attend a Super Bowl Party. An estimated 40% of the viewers are not even football fans. The average party consists of more than 17 attendees. Due to the food consumed during this much celebrated event, anti acid sales normally see a 20% increase in sales the next day. This and more interesting habits of Super Bowl fans can be found below.